(Rick Egan | Tribune file photo_ The Cleveland-Lloyd Dinosaur Quarry is now Jurassic National Monument under a historic Emery County lands bill enacted last month by Congress. The spot contains the one of the world's densest deposits of dinosaur bones, mostly from allosaurs.The bill protects more than 1 million acres of public land in Emery County, including the San Rafael Swell, Labyrinth Canyon and Muddy Creek. The Cleveland-Lloyd Dinosaur Quarry has yielded 10,000 to 15,000 bones, including some from at least 46 allosaurus skeletons. The quarry, 20 miles east of Huntington, is now Jurassic National Monument under sweeping public lands legislation signed recently by President Donald Trump. The site harbors fascinating scientific puzzles because of its preponderance of bones from the mighty three-clawed predator allosaurus, according to University of Wisconsin-Oshkosh paleontologist Joseph Peterson. Herbivorous animals should always outnumber carnivores, but bones from predators outnumber those from prey by 3 to 1 at Cleveland-Lloyd, where plant-eating camptosaurus, stegosaurus and camarasaurus remains have also been recovered. Peterson and other paleontologists have spent careers trying to solve this mystery. But, with every clue they uncover, new questions arise. 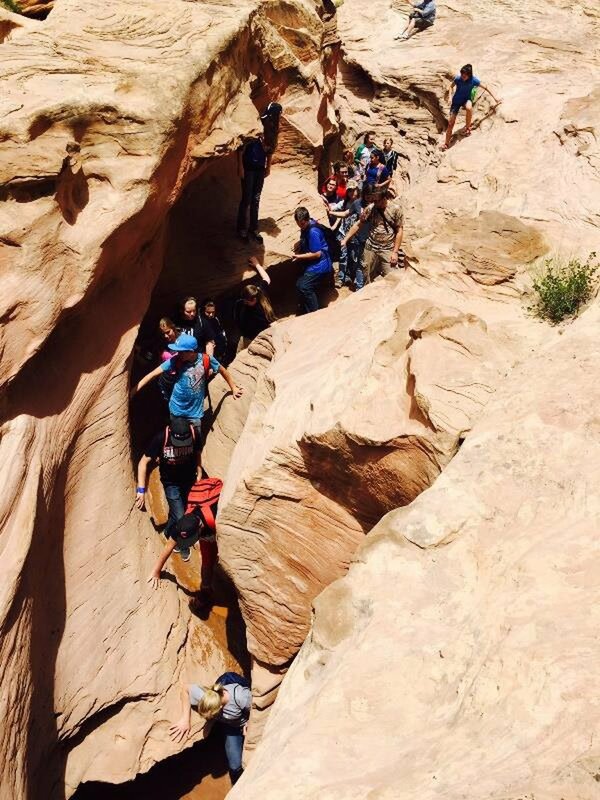 (Photo courtesy of the Bureau of Land Management) Hikers crowd the narrow slots of Little Wild Horse Canyon in the San Rafael Reef. This area will soon be added to Goblin Valley State Park, which is to expand by 6,200 acres under a public lands bill designating wilderness and a new national monument in Emery County. At 850 acres, Jurassic National Monument is the smallest component of the Emery County Public Land Management Act, championed by Rep. John Curtis, R-Utah, and passed by Congress last month as part of a much larger omnibus lands bill. The Bureau of Land Management, which oversees the more than 1 million acres affected by the bill, declined to make anyone available for an interview for this story. The law directs the agency to produce management plans for Jurassic National Monument and other areas receiving protective status. Combined with Dinosaur National Monument farther north and the plethora of fossil finds inside Grand Staircase-Escalante National Monument farther south, this new monument helps solidify Utah’s reputation as a prehistoric wonderland. Utah political leaders, who have long decried presidential national monument decrees, praised the Jurassic designation as one done the “right way,” because it is confined to a small area surrounding the scientifically significant objects to be protected and was made with congressional approval, as opposed to “unilateral” White House action. The bill also directs the Interior secretary to “convey” 6,261 acres to the Utah Department of Natural Resources for an expanded Goblin Valley State Park, tripling its size by adding heavily used public lands nearby to the park famous for its eerie, precariously balanced formations. While wilderness advocates and paleontologists applaud the bill’s passage, they are concerned about whether the BLM has the resources to adequately manage the designated lands and protect their resources. In addition to the monument, the bill also designates the most wilderness — lands where permanent structures, roads and mechanized equipment are prohibited — in Utah since the 1984 law that established the High Uinta and several other wilderness areas on national forests. The Emery lands bill mirrors one for Washington County passed in 2009 and is seen as a possible template for resolving contentious turf battles in other southern Utah counties. To celebrate the historic legislative achievement, Curtis will host an “awards assembly” Wednesday in Castle Dale as part of a five-stop town hall tour next week through southern Utah. Lt. Gov. Spencer Cox; the governor’s deputy chief of staff, Mike Mower; and state Sen. David Hinkins, R-Orangeville, will join Curtis for a Q&A session at Emery High School from to 2 p.m. to 3 p.m.
• Establishes 660,000 acres of wilderness in unroaded scenic places such as Big Wild Horse Canyon, Muddy Creek, Nelson Mountain, Rhino Head, Turtle Canyon, Eagle Canyon Horse Valley and Sids Mountain, more than tripling the amount of BLM holdings designated as wilderness in Utah. 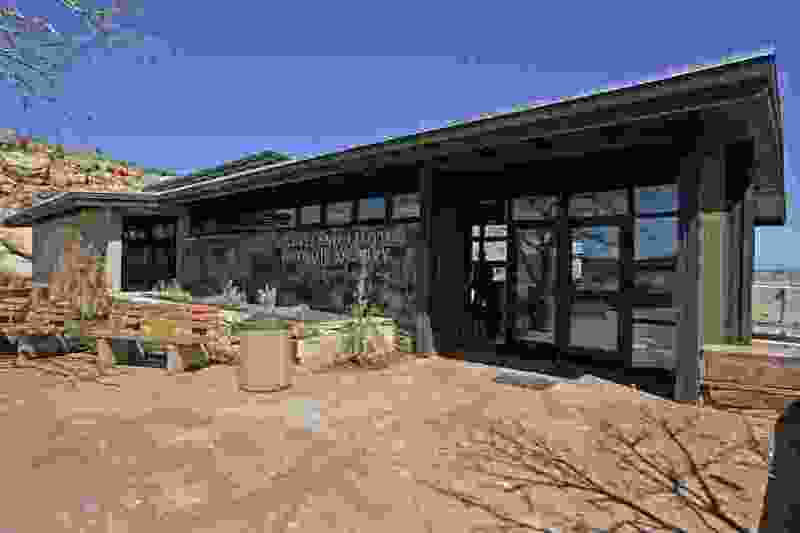 • Designates the 217,000-acre San Rafael Swell Western Heritage and Historic Mining Recreation Area. • Protects 63 miles of the Green River under the Wild and Scenic Rivers Act. Specifically it designates as “scenic” the 49-mile stretch downstream from Bull Bottom through Labyrinth Canyon to the Wayne County line. • Directs Interior to convey 640 acres to the city of Emery for public recreation, 320 acres to the county to expand the Huntington Airport, five acres to the sheriff’s office for a substation, and five acres to the county for an information center at Buckhorn Wash.
• Authorizes the exchange of around 100,000 acres of state trust lands inside the newly designated wilderness and recreation areas for BLM land elsewhere in the state. 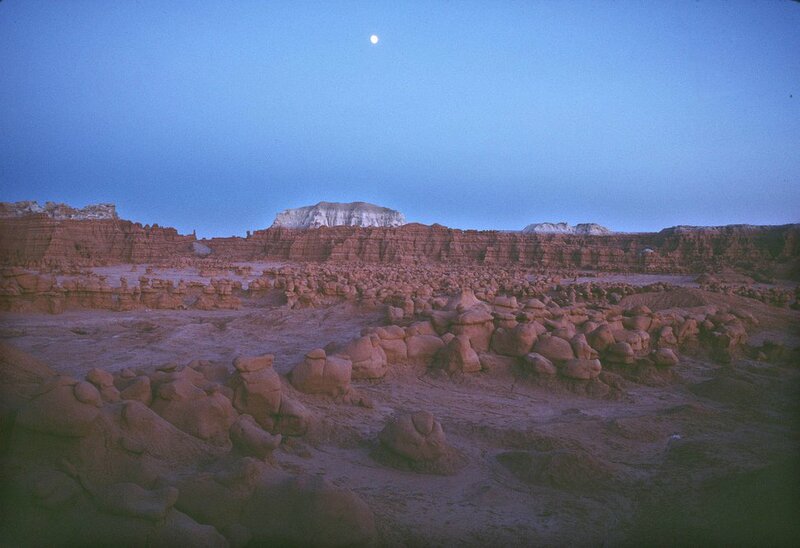 (Al Hartmann | Tribune file photo) The moon rises over Goblin Valley State Park, which is to expand by 6,200 acres under a public lands bill designating wilderness and a monument in Emery County. As a concession to industry, the bill “released” 17,000 acres of wilderness study areas, meaning these lands are returned to multiple use and may now be mined. Grazing will be allowed to continue in the San Rafael Swell and the new wilderness, but no new oil and gas leases or mining claims will be issued on these lands. Goblin Valley State Park is to triple in size to about 10,000 acres, but it is unclear whether the added acreage will be given to the state or managed by the state in partnership with the BLM. Either way, visitors to the heavily used trails and dispersed camping areas outside the park soon can expect to pay Goblin’s entrance fee. The bill adds trailheads used for Bell and Little Wild Horse canyons to the park, but not all of the canyons themselves, which are among some of Utah’s most popular hiking destinations, according to Jeff Rasmussen, director of the Utah Division of State Parks. Possibilities include new motorized and mountain bike trails and yurts, which have been hits at other state parks. “On Memorial Day, you walk single file with a thousand other people up Little Wild Horse Canyon. It’s not a wilderness experience. You have so much use there. You will have county, state and federal agencies working together to make Goblin Valley a better experience,” said Nelson, who now serves on the county’s Public Lands Council. But in less-used areas, unprepared visitors get lost. “How about spending some money to put up some signage? We need more camping spaces and toilet facilities,” said Nelson. He also hopes the federal government will invest in Cleveland-Lloyd, which he considers a national treasure. The quarry will be open this year from April 18 to Sept. 2, Thursday through Sunday, 10 a.m. to 5 p.m. Admission is $5 for adults, free for kids under 16. The site, located up a 12-mile dirt road from State Road 10, has a visitors center. Two aluminum structures rest atop the quarry, which has yielded so many paleontological riches. Peterson spends part of every July at the quarry, searching for new specimens and clues to what happened there 150 million years ago. He and his students camp nearby. The more pressing questions for Peterson are whether science will continue unimpeded at the quarry and whether the site will be adequately protected as visitation increases.